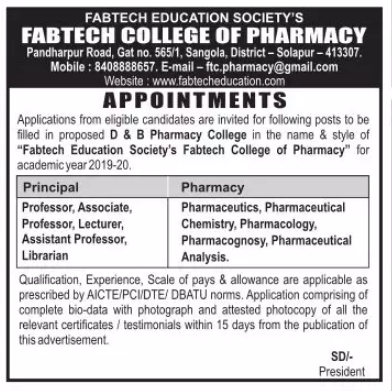 Fabtech College of Pharmacy, Solapur has advertised in LOKSATTA newspaper for recruitment of Professor / Associate Professor / Assistant Professor / Lecturers Plus Librarian jobs vacancies. Interested and eligible job aspirants are requested to apply within 15 days from 11th April 2019. Check out further more details below. About College: The Fabtech Education Society, Pune is a ethnicity for higher education.The primary motive of FES is to empower rural youth through education and eager to create and put into action such ideas, methods, techniques and information. FES is an educational mission and a dream of its founder - Hon. shri. B.A.Rupnar, an Eminent industrialist, a multifaceted visionary who has futuristic. How to Apply: Interested and eligible candidates are requested to send their CV along with attested copies of certificates, testimonials and recent Passport Size photograph to the postal address or email address mentioned below.